In yesterday’s Eat Your Heart Out post, I highlighted a Time Magazine story about our current understanding of what really contributes to heart health. Today, I want to address a related story about a recent finding that not all omega-3s are created equal. 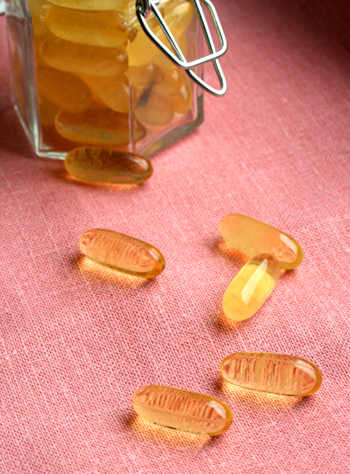 Think of omega-3s as the oils that keep our brains and hearts from getting rusty. Hundreds of studies show that these essential fatty acids can help prevent cardiovascular disease and some scientists believe they are also beneficial for the brain and nervous system. The ones with the biggest health benefits are found in fish like salmon and mackerel, which have the two long chain fatty acids docosahexaenoic (DHA) and eicosapentaenoic (EPA). Plant-derived omega-3s – the fatty acids found in flax seeds, olive oil and some leafy greens – don’t contain these specific fatty acid chains. While they’re also thought to be good for the heart, they don’t have quite the same effect on the body as their fish-derived cousins. “Both types of omega-3s are essential for our health because the body cannot make them on its own. [But] people who regularly consume fish have less chance of dying from heart disease. For plant-derived omega-3s, the suggestive evidence is unconvincing and more research needs to be done to make stronger claims,” says Dariush Mozaffarian, an assistant professor of medicine and epidemiology at Harvard Medical School. The difference between the two groups of omega-3s is now at the heart of a debate in the European Union. In 2007, the European Parliament passed a law allowing companies to tout the health benefits of omega-3s on their food products without having to differentiate between the plant-derived and fish-derived kinds. With the trial period due to expire in January 2010, the European Commission, the body that recommends which legislation will go before the Parliament, approved a proposal in October to make the statute permanent. The Parliament will decide on the issue in January. Read the full article and be sure to request my brandnew 24-page Ditch The Diets booklet.